such a cute concept! love it! Super cute idea!!!! I absolutely love this! Goodbye manhood. Oh look, a badass scene of Levi disabling the female titan single-handedly. I just finished watching the episode about that and then i saw this.. YOU MADE MY MOMENT! Eep! This is darn adorable! SO MUCH CUTE STUFFEDINTO ONE PECE I cant even handle it~! OMG!!!!!! soooooo cuteeeee AAAAAAHHHHHHHHH!!!!!!!!!!! SSSSSOOOOOOADORABLE!!!!!!! !I CAN'T CONTROL MYSELF!!!!!!!!! OHMYGODDOYOUSEEHOWCUTETHISIS!?!?!?!?!?!?!?! CAN I JUST HIGGLE IT AND CUDDLE IT PLEASE!?!?!? 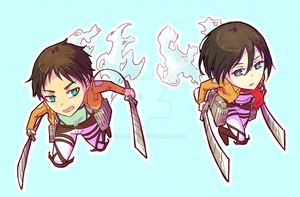 Awesome fan art but Eren seems like a girl. Oh my god.. this is so cute. That was one of the most cutest scene I saw. 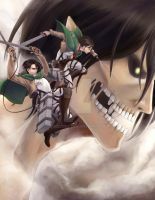 I really love to see how much Mikasa care's about Eren.